I missed posting for Pie Day, but who doesn’t like a slice of pie on any day of the year? Process, flour, salt, sugar and butter in food processor until in coarse crumbs. With machine running, add water in a slow stream through feed tube. Pulse until dough holds together. Be careful not to process more than 30 seconds. Divide dough into two equal balls. Flatten and wrap in plastic. Chill. Roll out for pie crust. Peel and slice 6-8 apples. Toss with 1/3 cup of sugar, 1/4 tsp. cinnamon, and 2 Tbsp. flour. Fill bottom pie pastry. Dot with a few bits of butter, maybe 1-2 Tbsp. Cover with top crust and vent. Bake at 450 degrees F for 15 minutes, then turn oven down to 350 and bake another 35-45 minutes, or until crust is golden and juices are bubbling. 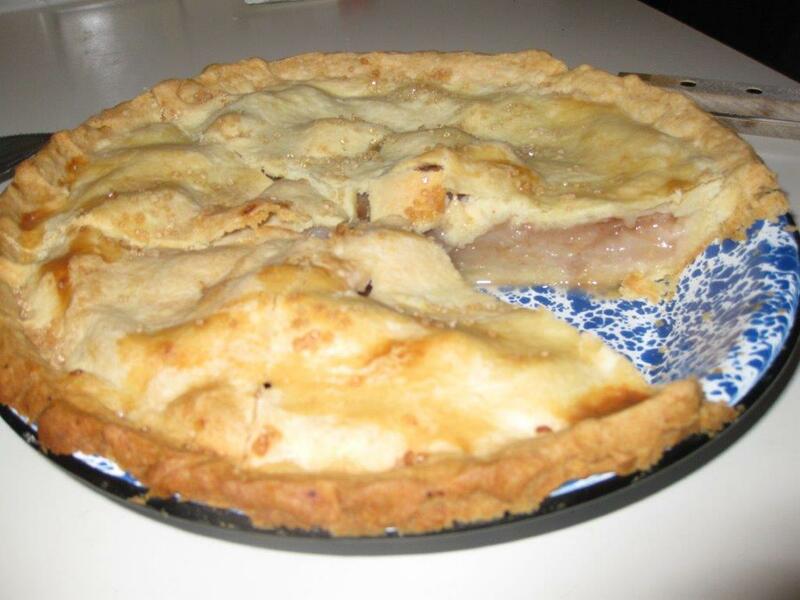 That is an absolutely delicious looking apple pie! It was delicious! Past tense. Not a crumb remaining.